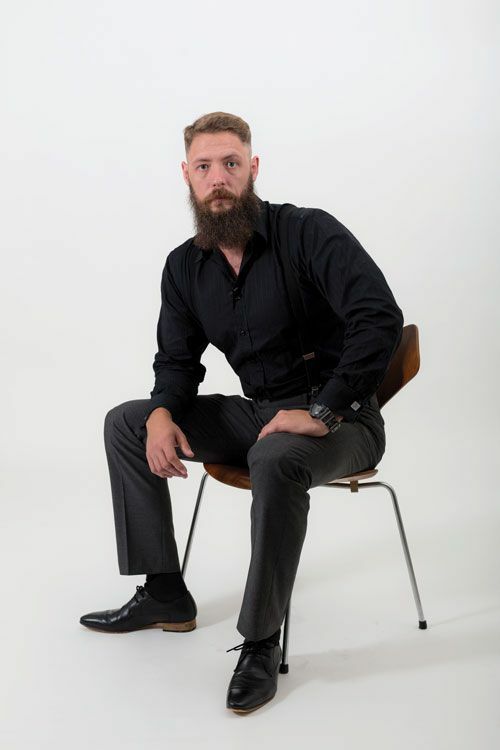 Occupation: Business Owner, The Darkheart Beard Co.
What’s your morning routine? I’m up at 5:30am most mornings for strength and conditioning clients. After that I have a coffee. Sit down, enjoy some sunshine with my dog. And then I’ll kind of start planning my day out. Watch a couple of motivational videos. Simon Sinek is a favourite of mine right now. And then get into my day. What are the top three things on your bucket list? I’d like to go to India. My mum grew up in India, so I’d like to go and visit there. I would also like to go to the Isle of Man. What advice would you give your 20-year-old self? I would probably say, train a little bit harder. Train a little bit smarter. Read more books, and enjoy what time you have with family now. How do you stay motivated? By being around motivated people. I certainly get a lot from that. Having a good support network around me. My business partner Joe, friends and family – that kind of thing is what motivates me. If you didn’t need money, what would you do? What I’m doing right now, I think. We started a business on a shoestring and we’ve become pretty successful. I don’t think money actually matters if you’re enjoying what you’re doing. What is your secret to success? Not giving up. I’ve had some knock-backs and life was pretty tough from time to time, and just not stopping. Just keep putting one foot in front of the other and ploughing on. What’s the best bit of advice or quote that resonates with you? It’s a little bit corny, and a little bit cliché, but probably a quote from Rocky. “Life will beat you down. Just keep going, don’t let things get to you and just keep trying”. What is your favourite restaurant for work? I don’t spend a lot of time in restaurants, to be fair. I do like Caffe E Cucina which is on the shore in Albany. They do some pretty good Italian food. What is your secret to living longer, more satisfying life? As I’ve gotten older, I’ve realised it’s not about the quantity of people around me, it’s the quality of people. That really helps. Helping others and giving as much back as I can. You don’t have to do anything for me, but if I can help you in some way, then that makes me feel fulfilled. What makes you feel alive? Coffee, mostly. Business. Doing what I enjoy. Training, helping others and enjoying this business journey.